The present investigation was carried out during Kharif 2014. The experimental material consists of 40 different genotypes of okra with three checks Arka Anamika, Parbhani Kranti and Pusa Sawani. 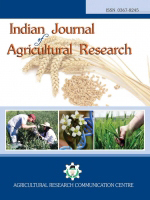 The materials were grown in randomized block design with three replications during Kharif 2014 on the field of Department of Agricultural Botany, College of Agriculture, VNMKV, Parbhani. The investigation carried out in the present study revealed that the genotypes 136 Thin, 003163, Kashi Pragati, Kashi Vibhuti and BO 13 showed better performance for traits namely plant height, length of fruit, calcium content, iron content, vitamin C content and fruit yield per hectare. Among the genotypes 136 Thin and 003163 had given highest yield. The high genotypic and phenotypic coefficient of variation was observed for characters namely number of branches, yield per hectare, yield per plot and yield per plant. All these traits indicate additive effect showed response for selection. High heritability estimates were found for characters like number of branches, yield per plot, iron content, yield per plant, plant height, vitamin C content, number of seeds per fruit (dry fruit), fruit bearing node and calcium content indicated good inheritance of these characters. High heritability coupled with high expected genetic advance was observed for characters like plant height, calcium content, yield per plant and yield per hectare, indicated presence of additive gene action and phenotypic selection may become more effective for desired genetic improvement. Genetic Variability, Genetic Advance, Heritability, Quality Traits, Yield Components.